The partnership between the Sailing Team GAC Pindar and watch company Armin Strom , yacht skipper Ian Williams visited the studio of the brand in Biel. Immediately after participating in a regatta Alpari World Match Racing Tour in St. Moritz, triple champion made a stop in the production of the brand Armin Strom. During the visit, the team captain has studied in detail the process of making limited hours ARMIN MANUAL WATER-Special Edition GAC Pindar Sailing Team, released in honor of sponsoring brands sailing team GAC Pindar. 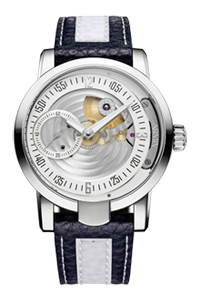 Hours, which is a limited edition of only 40 copies, function on the basis of the manufacturing machinery AMW11 with trim and engraving inspired by marine issues. Caliber is decorated entirely by hand. The aim of cooperation sailing team GAC Pindar and watchmaker Armin Strom is an original interpretation of the subtleties of extreme sailing “through the eyes” of modern precision mechanics. Presentation of hours passed in a close circle of sailors with the Director of Armin Strom Grayslera Claude (Claude Greisler), a passionate lover of surfing, and Flavio Marazzi – brand ambassador and member of the class regatta Star Boot, held on the last Olympic Games in London.